Last week I shared a Valentine's Day gift guide for men. I considered sharing a gift guide for women this week, but (most) women are easy to shop for: jewelry, perfume, a cute handbag.....nothing new. Instead, I decided to let you tag along with me while I browse my favorite shops on Etsy looking for Valentine's Day decor. 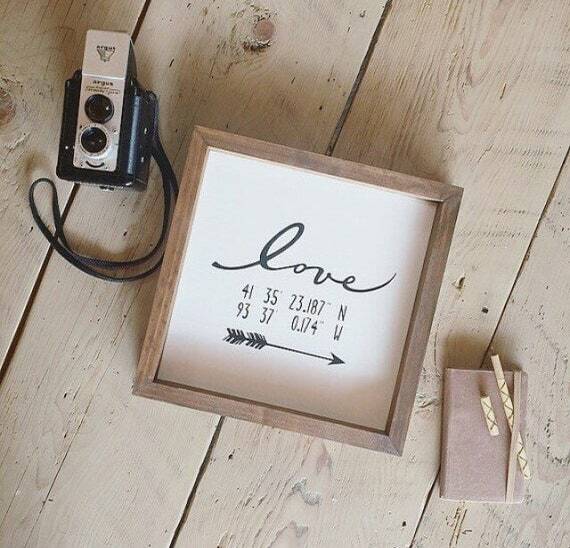 I am a big fan of styling with signs (I'll be posting about how I styled my house with signs soon), so I'll start with this Love Sign with lovers gps coordinates from East Plum. Okay, so if you got this for your man he may not swoon, but if he got it for you....totally swoon worthy! 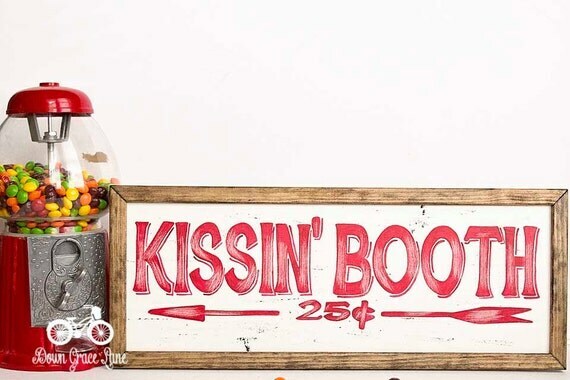 This Kissin' Booth sign from Down Grace Lane on Etsy is super fun (at the rate I'm going I may need to start charging Michael for kisses so I can pay for my new decor items, so the sign may come in handy! LOL). I am in love with all three of these signs from My Trusted Treasures! 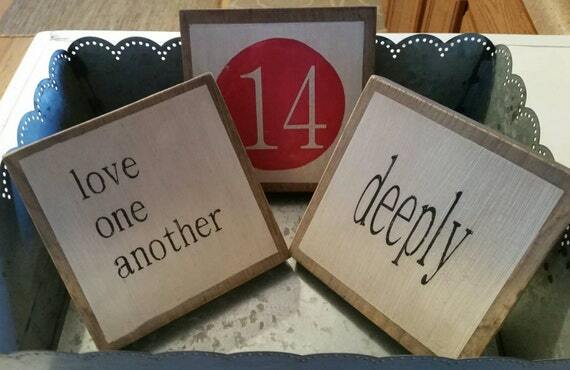 The 14 is fun and whimsical, and the Love One Another and Deeply signs would be perfect bedroom decor year-round! 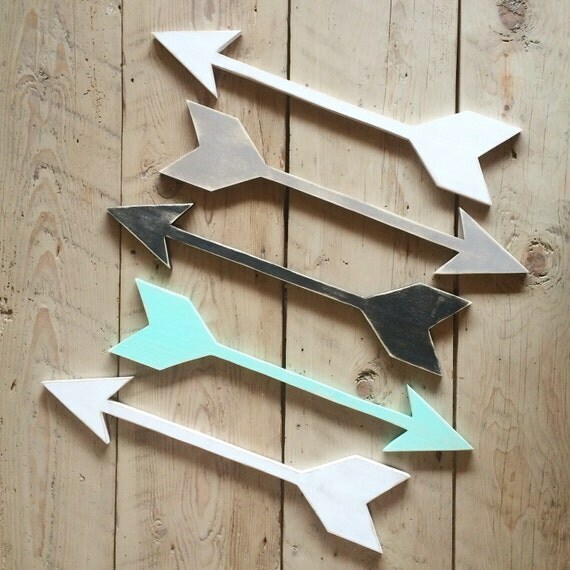 Love these wooden arrows from East Plum. Bonus: if you don't get pink or red you could leave them up all the time! 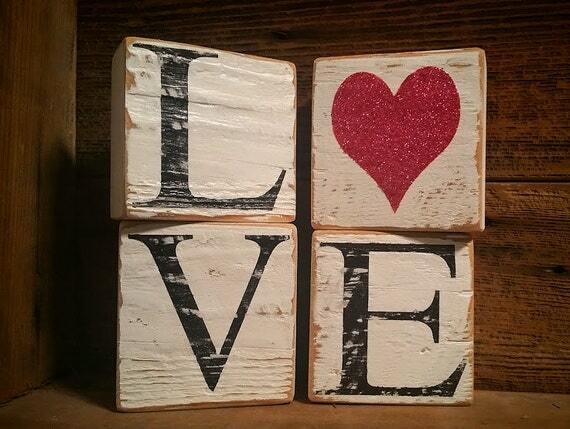 These cute little LOVE blocks by Creations By L. Love would be adorable sitting on a bookshelf! Love is All You Need. Enough said. 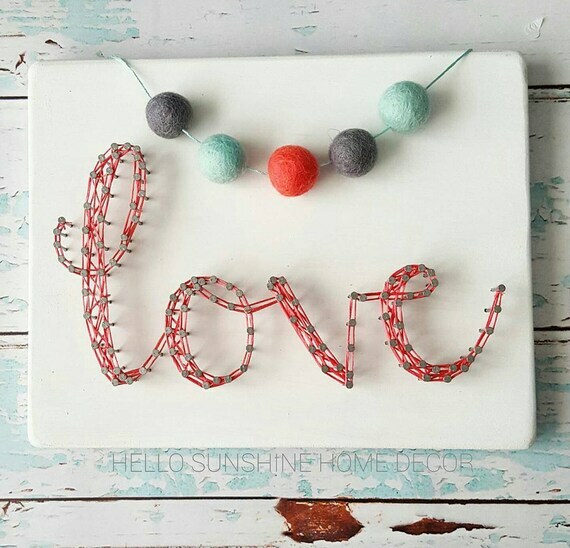 But I will add that you can buy it from Hello Sunshine Home Decor! 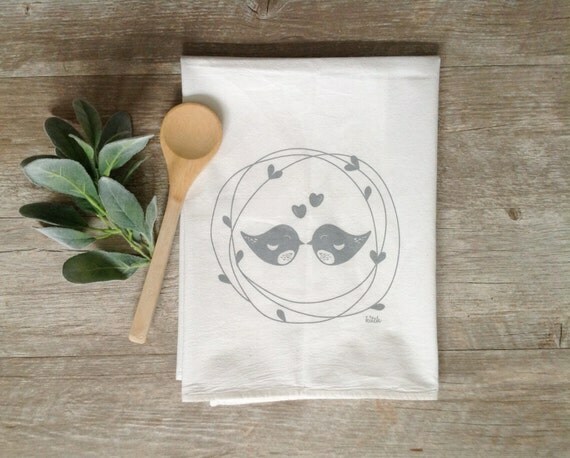 This tea towel by Kitch Studios is precious! 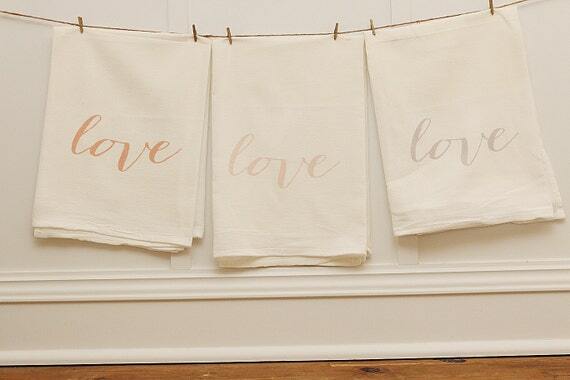 This love tea towel by So Vintage Chic would be a perfect pair to the love birds towel! So Vintage Chic also has pillows! 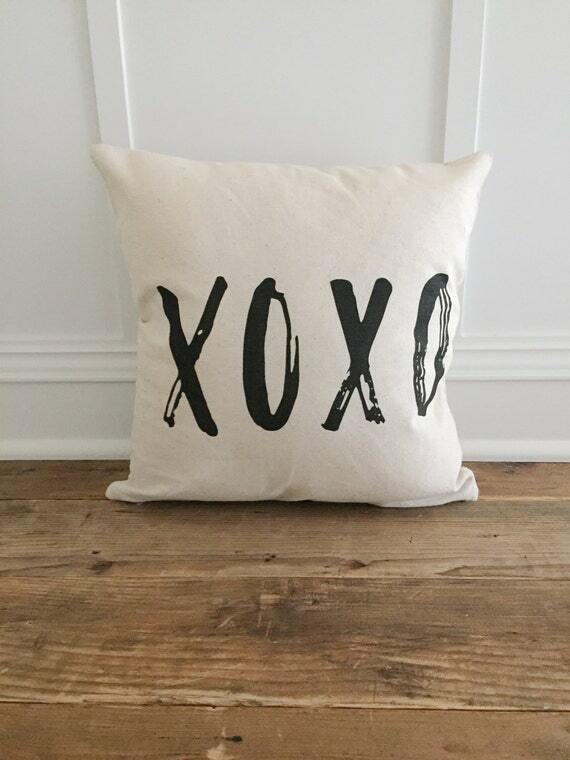 This pillow would be a fun addition to your couch (and since it's black and white you could leave it out past Valentine's Day)! 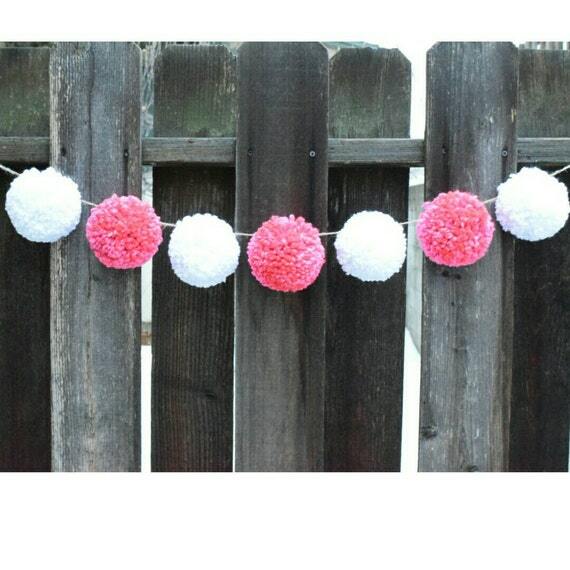 If you're crafty you could try to make a pom pom garland for your mantel, but if you're not, you can order this adorable garland from Our Burlap Bungalow. 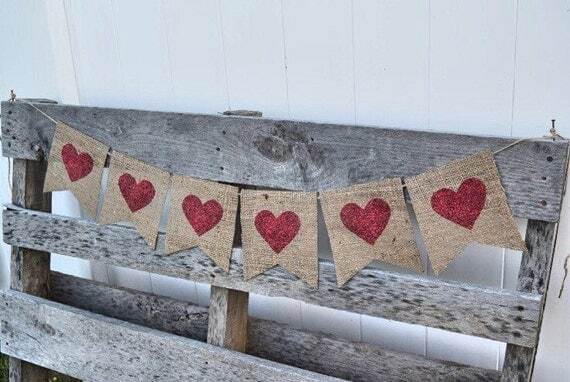 How perfect would this heart banner from Olivia's Sweet Lullaby look with the pom pom garland? 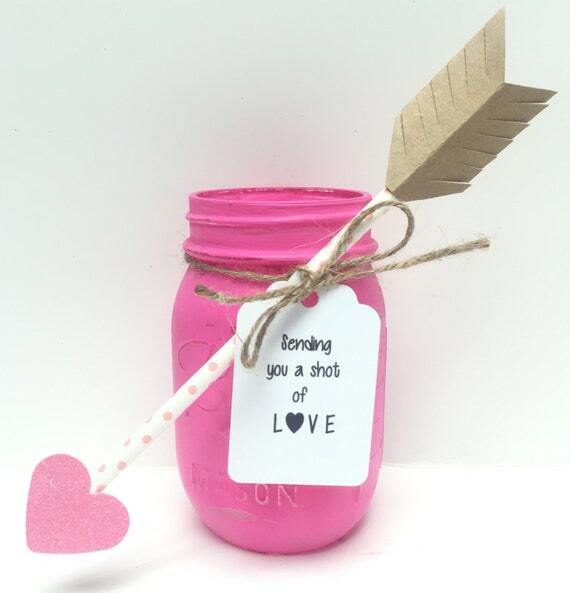 This painted mason jar from Pretty Simple Studio would be so pretty with some white hydrangeas on your kitchen table! 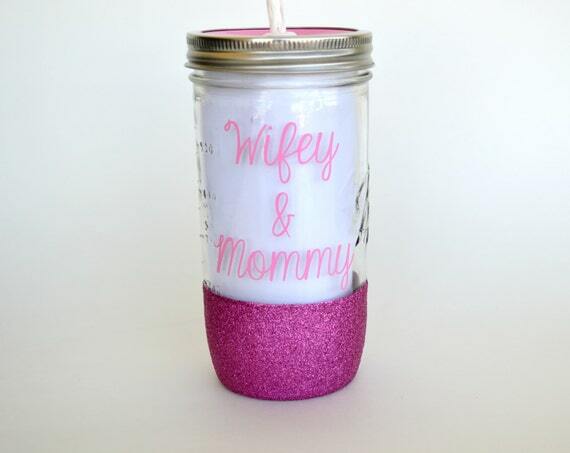 How cute is this glitter tumbler from Drink Bliss? It's doesn't exactly qualify as Valentine's Day decor,but it's pink and there's glitter, so I had to make it my number 13! I think I may be in trouble because I want to order one of everything! Which is your favorite? I don't know about you, but I sometimes get stuck in a rut when it comes to hair & beauty products. I like trying new things, but it's hard to justify spending money on something that I'm not sure I'll like. I used to wear the least amount of makeup possible. Part of that was because I didn't like the way makeup looked on me, but it was mostly because I didn't know what products to buy or how to apply them. Pinterest and YouTube changed that for me! I am by no means an expert on applying the products, and won't be doing a tutorial anytime soon (I'll leave that to the pros), but I do feel like I have some knowledge about the products and I have a drawer full of makeup, so I decided to start a monthly feature on my most used products. It will mostly include hair & beauty products, but I'll also throw in few other things for fun. I'll start at the top! I am always looking for the perfect hair styling product that will add volume, smooth, add shine, do everything! The Living Proof Perfect Hair Day 5-in-1 is the closest thing I've found to that. I use about a dime sized amount on towel dried hair and style as usual (in my case that means blow drying and straightening with a flat iron). Some days I want to add a little texture to my look, so I use the Living Proof Instant Texture Mist after blow drying, but I've started using it before blow drying and I'm really loving the look! I have a lot of flyaways and baby hairs, so I use Maybelline Great Lash Clear Mascara to smooth them down. I'm sure there is a product out there that is designed for that, but I haven't discovered it yet and the mascara works. I usually "paint" it on and then brush through it so it doesn't look crunchy. This picture is kind of awkward, but it gives you an idea of the flyaways I'm talking about and how the mascara helps tame them. Another blogger I follow raves about the Clinique Acne Solutions BB Cream so I decided to try it. I love it! It's very thin and liquidy, so you have to move fast when applying! I shake the bottle, pour some onto my fingers and quickly rub them together and put it all over my face. After I've done a good job spreading it out (not sure if that's the right word ~ kind of makes it sound like I'm spreading butter! ), I go back with a flat Kabuki brush and blend it out. I follow up with the Laura Mercier Matte Radiance Highlight powder and a tapered face brush. I don't put powder everywhere, just my cheekbones, the bridge of my nose, and my cupid's bow. For under my eyes, I alternate between the Maybelline Instant Age Rewind Eraser Dark Circle Concealer + Treatment in Shade 160 Brightener and the MAC Prep & Prime in Radiant Rose. Both work well, it just depends which one is closer. I usually use the applicator to put it under my eyes and then blend it out with my fingers. My favorite blush this month has been my Hourglass Ambient Lighting Blush in Ethereal Glow. It's actually down to the bottom of the pan, so I need to pick another one up soon! 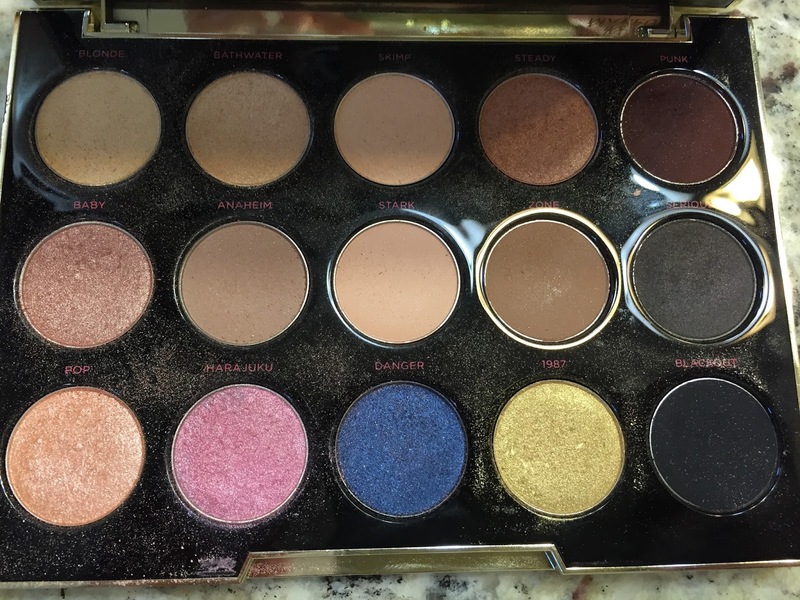 I got the Urban Decay Gwen Stefani Eyeshadow Palette for my birthday it November, and it's been the only thing I've used since! 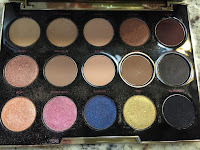 The variety of colors allows me to do everything from a neutral eye look to a dark smoky eye. I always use an eyeshadow primer prior to putting on my eyeshadow ~ it really does help keep the shadow from creasing and I find it gives it more staying power. Lately I've been using the Nars Smudge Proof Eyeshadow Base. For eyeshadow, I used to use the cheap brushes that came with my eyeshadow (you know, the foam teardrop brushes), but a few years ago I asked for some nice brushes for Christmas so Michael got me a Sigma Essential Kit (that should probably read: I ordered the Sigma Essential Kit and told Michael it was from him). I have three favorites which I've linked to below, but the one that I think everyone has to have is a great blending brush. It's great for blending out colors, and fixing mistakes! If you don't have a good blending brush you should definitely pick one up! 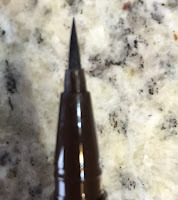 I was never very good with eyeliner until I discovered the Kat Von D Tattoo Liners. 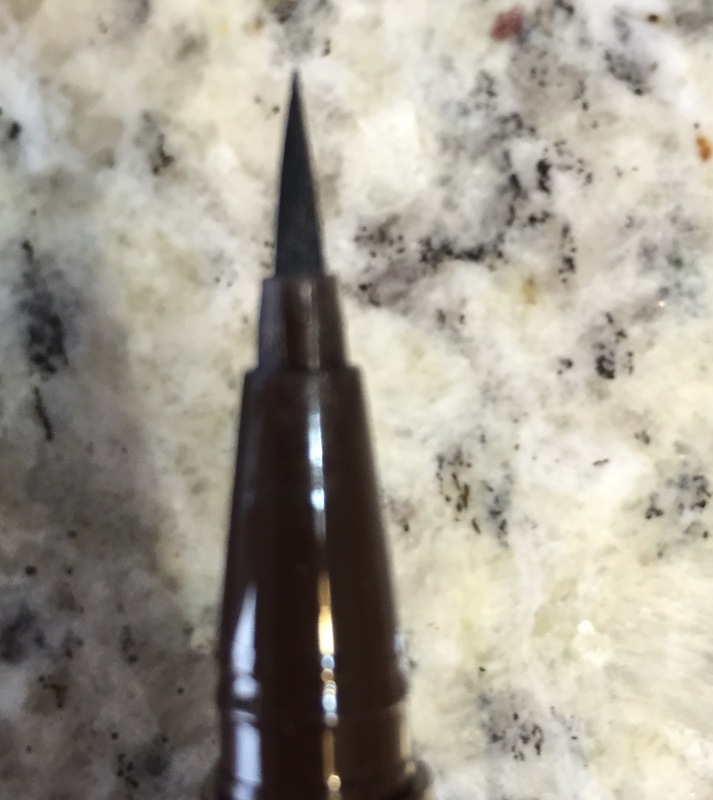 The brush tip allows for easy application (it's like a thin marker). I have both Trooper and Mad Max Brown, but this month I've been reaching for the brown more often. It gives a softer look. I finish my eyes with Maybelline Colossal Volume Waterproof Mascara. I've tried a lot of mascaras, both drugstore and high end, over the past few years and I always come back to Maybelline. It adds volume without looking or feeling clumpy (I used to pick my mascara off when I was younger because I couldn't stand how it felt, so this is important). For my lips I prefer a gloss. My favorite is still MAC Lipglass in Explicit, but on days when I want something a little more pink, I wear Buxom Full On Lip Polish in Celeste. Warning: it's a lip plumper so it kind of tingles. My favorite perfumes are the Elizabeth and James Nirvana Black & White fragrances. I occasionally wear them alone, but I prefer mixing them. I didn't realize when I bought them that Elizabeth and James is owned by Mary Kate & Ashley Olsen ~ who else is bummed they aren't going to be on Fuller House? My most worn clothes.....The shirt I keep grabbing for is my ruffle-front blouse from Banana Republic. When I saw it in online I wasn't sure how the ruffle from wrist to wrist would look, but I decided to give it a try. 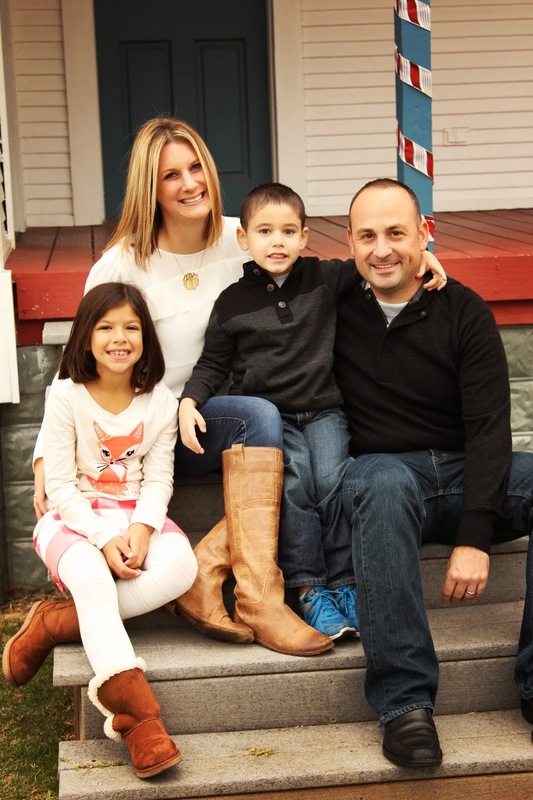 I am so glad I did because I LOVE it, and it was perfect for our family picture! I actually ended up ordering a printed one in navy and a solid black one too, so I have some options. :) My 7 for all Mankind skinnies are my most worn jeans, and they look great with my Toms Desert Wedge Booties, but I also love them with my Frye Paige Tall Riding Boots (pictured here)! Accessories...I'm notorious for taking my jewelry off in random places in our house and temporarily losing them. That happened with both my Fossil two-tone watch and my gold initial necklace, so I've been wearing them a lot since finding them again. I'm trying to work out again, so I usually wear my Fitbit Charge HR as well ~ every step counts, right? Well, there you have it! My most worn and used products for January! Hopefully this gives you a few ideas of some new things to try. What are your most used products? The pineapple principle is a phrase I coined a few years ago when I passed on buying a ceramic pineapple at Home Goods. To be honest, when I saw it I wondered who in the world would ever put it in their house....and then I went home and couldn't get it out of my mind! After looking it up and realizing that the pineapple is a symbol of warmth and welcoming, I decided that I had to have it! Well, guess what? When I went back to Home Goods the next day it was gone! Grr! 1. If you are shopping somewhere like Home Goods, TJ Maxx, or Hobby Lobby where products are often scarce, buy it! It's a lot easier to return something if it doesn't work than it is to go back to buy something that isn't there anymore. 2. If you're shopping somewhere like Pottery Barn, Target, or Pier 1 where products are restocked often, take your time! Hobby Lobby often fits into this category, but with their sales it's usually a good idea to grab things while you can. Simple, I know, but it took me missing out on something I'm still not even sure I really wanted to figure it out. Just for fun, I thought I'd find some pineapple themed items to share with you ~ in case you are inspired to bring a little pineappley goodness into your home! 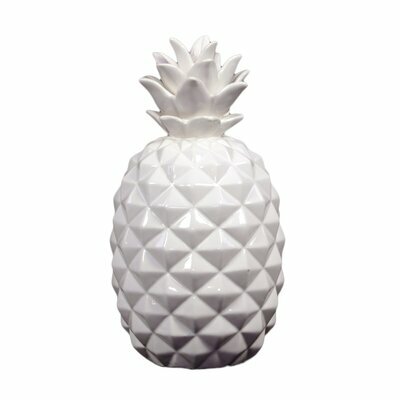 :) I haven't gotten my ceramic pineapple yet, but one may be making it's way into my home soon! I don't know about you, but there are several blogs I follow and I often find myself wishing there was one place I could go to see all of the updates. Well now there is! Actually, I think it's probably been around for quite some time, but I just discovered it today! Bloglovin' has all of the updated blog posts in one place ~ I love it! You can search for the blogs you follow and add them to your feed. It is really user friendly. There is even an iPhone app so you can follow all of your favorite blogs, including mine, on the go! Check it out ~ I promise you'll love it! I don't know about you, but I always have the hardest time buying gifts for my husband Michael. This usually means that I buy him something totally random and hope he likes it. I love giving (and receiving, I'm not gonna lie) gifts, and I want to know, not just hope, he'll like it, so it's always a struggle. Tickets. Movie tickets, concert tickets, sports tickets, any tickets! Michael loves all sports, so tickets to a game are always a good choice. For his birthday I got him tickets to an FC Dallas game, and for Christmas I bought a three game mini-pack to see the Texas Rangers. For both the soccer and baseball games I purchased four tickets so we could go as a family. Grooming products. Michael basically has a five o'clock shadow the minute he shaves, so a good shaving cream makes a big difference. I discovered Jack Black Supreme Cream Triple Cushion Shave Lather about a year ago, and it's the best shaving cream! A nice briefcase. This is what I think I'm going to get Michael for Valentine's Day. He has a Tumi expandable laptop briefcase now, but it's been well-loved and he could use a replacement. I'm thinking this time we'll skip the expandable one because he ends up sticking way too much in there and it weighs a ton! Athletic wear. Michael runs, so a good pair of running shoes, shirts (love Lululemon's running shirts - they don't smell! ), shorts, etc are always a safe bet. An experience. Think about what your significant other loves to do. Fishing? Cooking? Hunting? Adventure? In Michael's case, he loves to cook. Central Market offers couples cooking classes, so I purchased a Lobster Dinner Couples Cooking Class. A good book. This is important if you have children, especially if you have a son. Kids need to see both parents reading, and not just the Twitter feed on your phone! I purchased a few books for Michael over the holidays and now he's hooked. I'm always searching for new ideas, so please comment below if you have something different! It just dawned on me today that I haven't shared with you what I'm going to be (hopefully) doing for the rest of my life, or at least the near future! One of the things I always talked about with my students was finding a passion and following it. Well, #designismypassion, so I decided to pursue it as a career! I'm just in the planning stages, but I'm so excited! 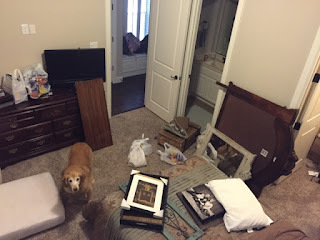 I have been helping my sister-in-law with her new house, and I'm working with another family who is doing a complete fixer upper (I'm helping on the design part) so we'll see what happens. It's amazing how some throw pillows can completely change the look of a room! When looking for furniture and bedding, I always try to look for solids and neutrals because it's so easy to change the look and feel of a room with pillows. We got our leather furniture set several years ago from Rooms to Go. It's part of the Cindy Crawford furniture line. It's been well-loved (maybe loved isn't the right word....Carter christened it shortly after we got it by drawing all over a few of the cushions with a blue pen, and the ottoman has a nice outline of the tray where it stuck and the leather pulled off) and eventually I'd like to replace it with a sectional or something a little more cozy, but for now it will do. It was a great price for leather furniture and we've gotten a lot of use out of it, though I still prefer our old couch for naps. ;-) I think I may be ready to change out our current pillows soon, but for now they'll do. I picked up the two patterned ones from Pottery Barn a few years ago and the more natural ones are from Home Goods. It looks so much homier and welcoming with the pillows! 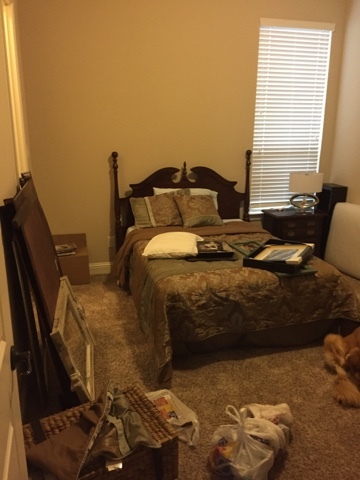 Right now we have a golden retriever that loves to sleep on our bed (you can see her bottom sticking out from behind the ottoman in the previous picture), so I refuse to buy new bedding. I like what we have, but after months of a her sleeping on the white duvet cover, it doesn't matter how much bleach I use, the duvet isn't that white anymore. I'd choose Bailey over new bedding any day! And it's still pretty from a distance. ;-) When I saw the personalized Mr. & Mrs. pillow at Pottery Barn I knew I had to get it. The chevron flower pillow came from Bed Bugs Boutique on Etsy. I bought it like three years ago, but she still has it in her shop along with a lot of other fun pillows and wall art (I may need to order some wall art - love!). The addition of the throw pillows dresses up the bed nicely. I wrote about our guest room in the previous post, so I won't go into details here, but notice how much better the "Home Sweet Home" pillow looks in here than the study. Again, the room looks more welcoming and homey. I love how a few accessories, like throw pillows, can completely transform a room, don't you? Happy New Year! Sorry I've been absent for the past few weeks. With Sophia, Carter, and Michael all home for the two week holiday break, I was pretty busy! We had a fantastic Christmas that flew by way too fast. I can't believe that we have already lived in our new house almost a year! It seems that since moving in last February the guest room has become the catch-all for anything that doesn't have a place. I decided that I needed to tackle the mess and make it an actual place where guests can sleep! Here are a few shots of the before. We already have a nice bedroom set and bedding, so it was more organization and accessories that I was after. I wasn't originally planning on replacing the headboard (why spend money if you don't have to? ), but when I saw this old door at Hobby Lobby I knew that it would make a perfect headboard. All I have to do is move one of the hooks so I can hang it horizontally instead of vertically and hang it on the wall. Right now it's just sitting on the bed. I plan to hang it a little higher so it's more visible, but I think I'll need Michael's help on that. I found a lot of fun decor pieces at Hobby Lobby. I am not a fan of birds, but when I saw this old birdcage (terrarium?) I decided it would be perfect to add a little color to the room. I picked up some cotton stems for filler. I simply pulled the cotton off of the stems and threw it into the cage. I was able to relocate the lamp on the nightstand from another spot in our house where it wasn't really needed. 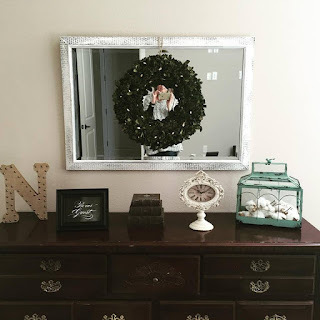 I had an old silver mirror in the closet, so I decided to paint it white and hang that above the dresser rather than using the dresser mirror or buying something new. I also found these fun framed paper flowers at Target. 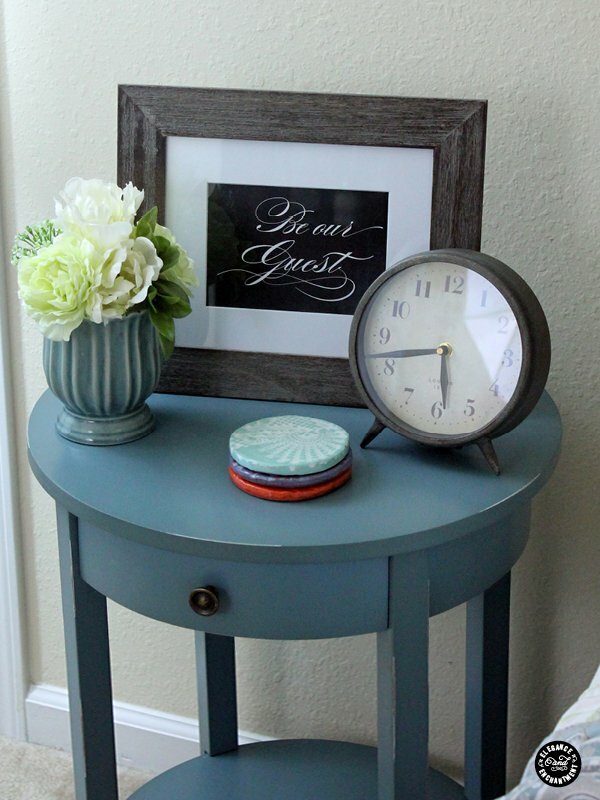 I found some fun guest room printables on Today's Creative Life, so I added the "Be Our Guest" and Wifi password to the room as well.